This is a salad that aims to please. It’s hearty and healthy, grainy and nutty. It’s easy to make, beautiful to admire. It’s there when you need it and willing to cater to your whims. 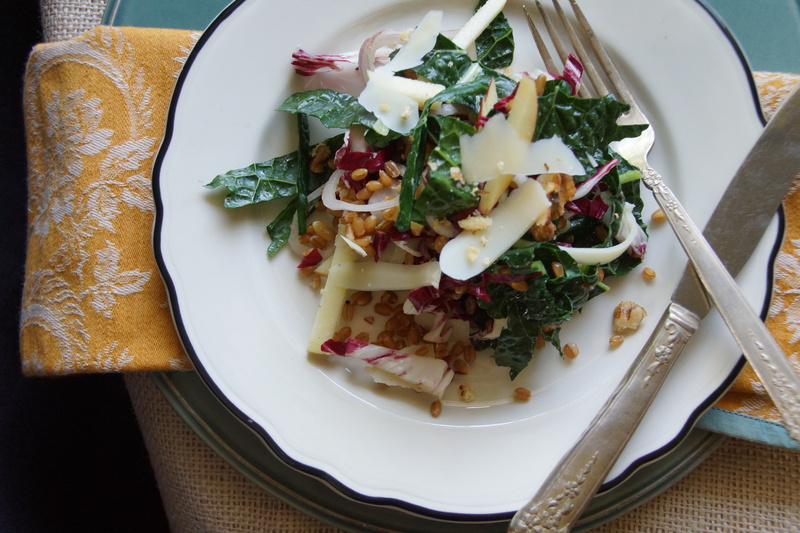 This salad won’t let you down. What are we waiting for? Let’s put it together. Get the wheatberries simmering; this’ll take awhile. Let them do their thing while you do yours. Take out the trash , iron a shirt, water your houseplants. We’ll meet back in forty-five. Assemble your team. 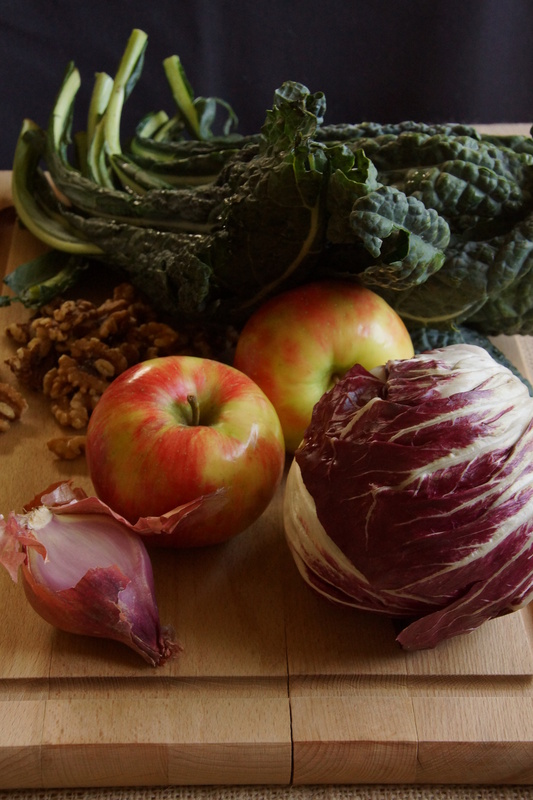 Dark green kale meets garnet-colored radicchio, crisp apple, shallot, and walnuts. 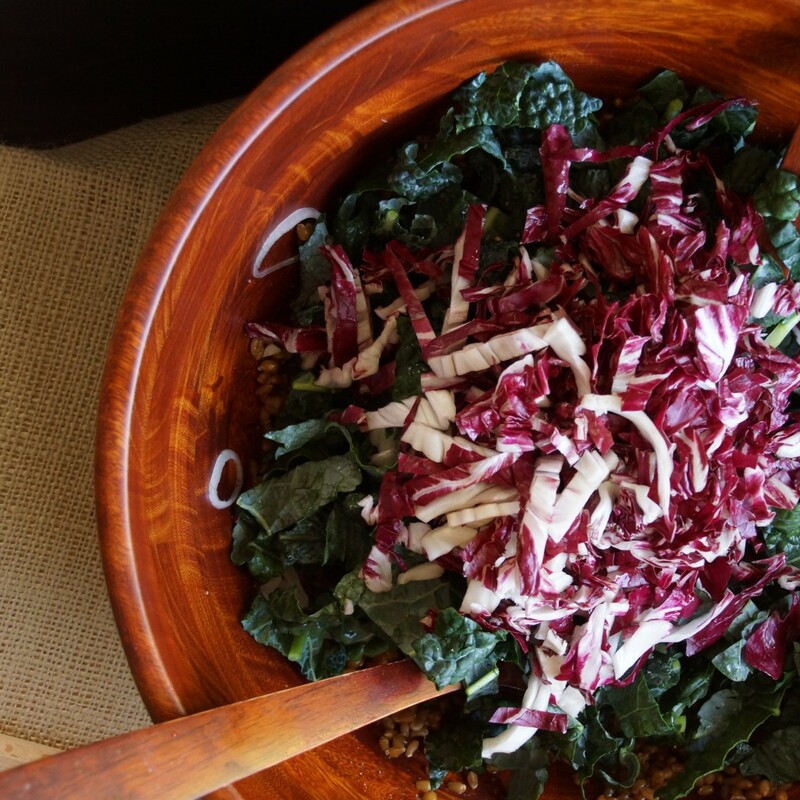 Kale gets chopped, rinsed, and spun while radicchio is turned into ribbons. Toast the nuts, turn the apple into matchsticks, and slice the shallot. 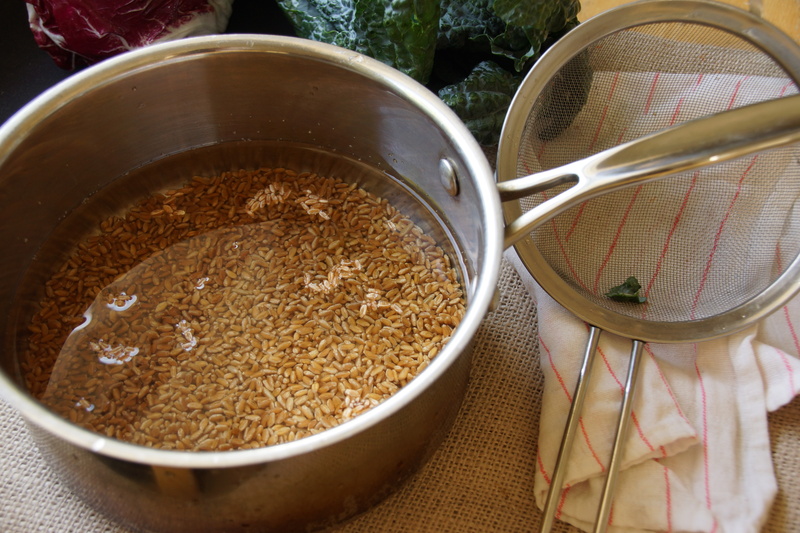 Treat your wheatberries to some zippy dijon, a glug of walnut oil, couple splashes of vinegar. Grab the rest of the gang and toss in a big bowl. Add curls and shards of Parmesan. Congratulations, now you have a big tasty salad that’s going to see you through the week. Put it in your lunchbox, eat it straight from the salad bowl at midnight, or serve it as a side. You could saute it and serve it warm. You could add some lentils or sweet potatoes. Don’t like the idea of a vegetarian main course? That’s fine, top it with a luscious, bone in, grilled, double cut pork chop. This salad is not here to judge. This salad works for you. This versatile salad makes a satisfying, healthy lunch or a great side with pork for an autumnal or winter dinner. 1-2 T. White Wine Vinegar. 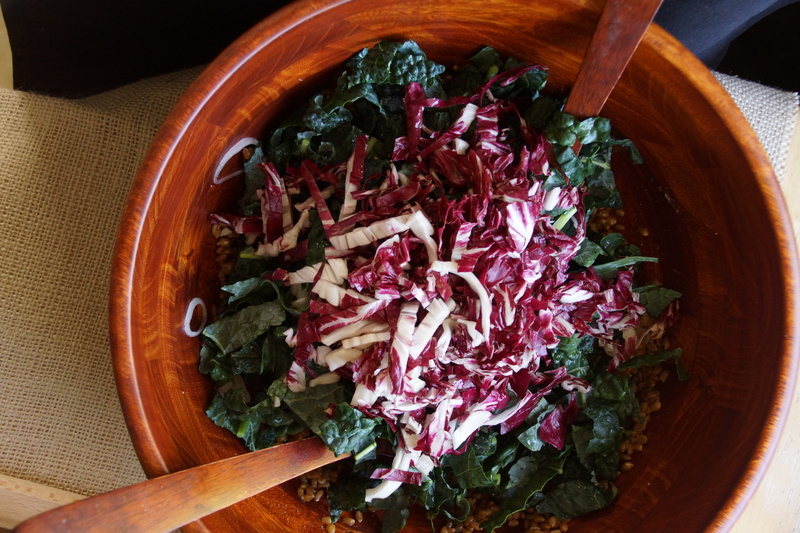 Place warm, cooked wheat berries in large salad bowl, add 1-2 T. dijon mustard (depending on how much bite you like) and toss to coat. Add oil and vinegar, season generously with salt and pepper. 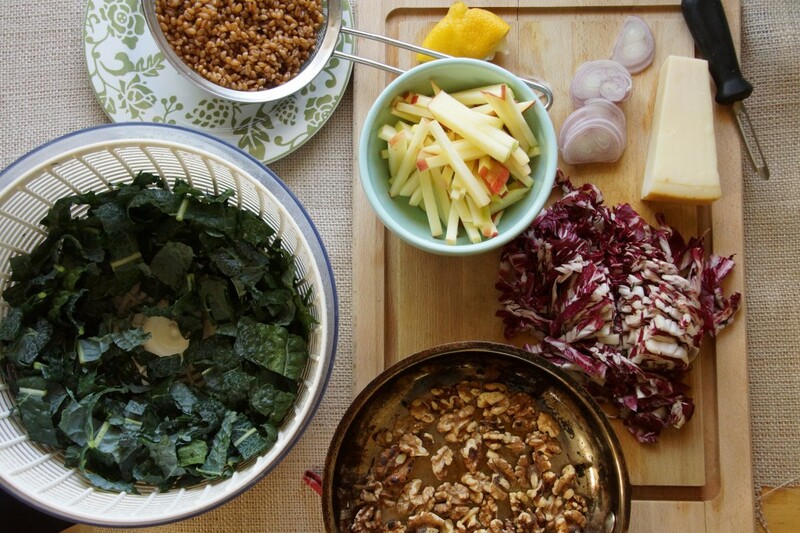 Add kale, radicchio, and shallot. Toss well, seaon with additional oil, vinegar, salt, and pepper as needed. Add nuts and apples, toss gently. 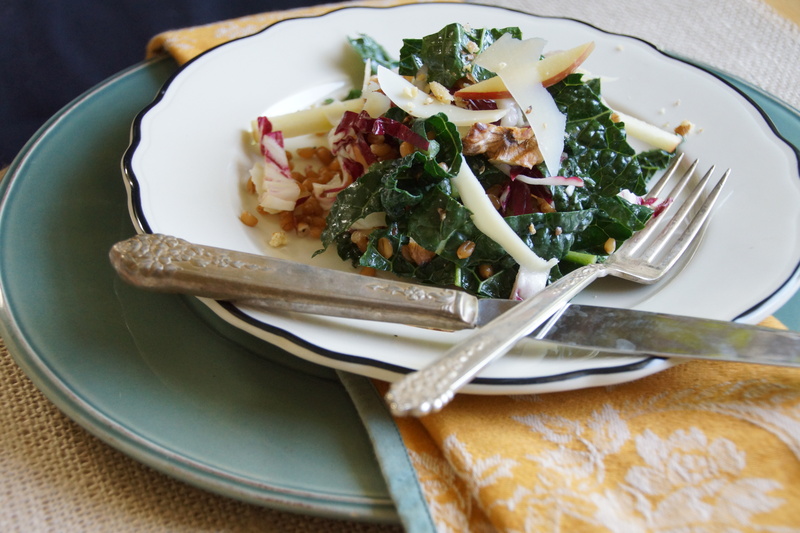 Divide among plates and top with plenty of shaved Parmesan. love the ingredients picture taken from above! This looks so fresh and delish! Beautiful salad, Sarah, and tasty too, I had it tonight! Everything you have posted so far looks amazing. 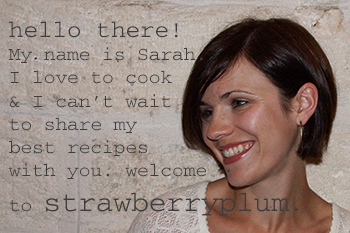 So happy you finally started this blog so now I can finally steal some of your scrumptious recipes. Can’t wait for more to come as we head into fall, I do love your bean soups! Thanks, Lolly. As soon as the temperature drops I’m sure I’ll be making some bean soup! So glad your camera is okay! Can’t wait to try the granola – I can just imagine the smell – mmmmm! Kale salad was wonderful! Your house will smell like a cookie factory for days after making the granola and everytime you turn on your oven it’ll release another sweet, spicy, gingersnappy breeze. Move over “Glade”. Nice blog, I found lots of information on your site. I’m going to add your blog to my favorite sites. Thanks, Laura! I’m glad you liked the salad and I will definitely keep the recipes coming…the colder it gets, the more I feel like being in the kitchen!